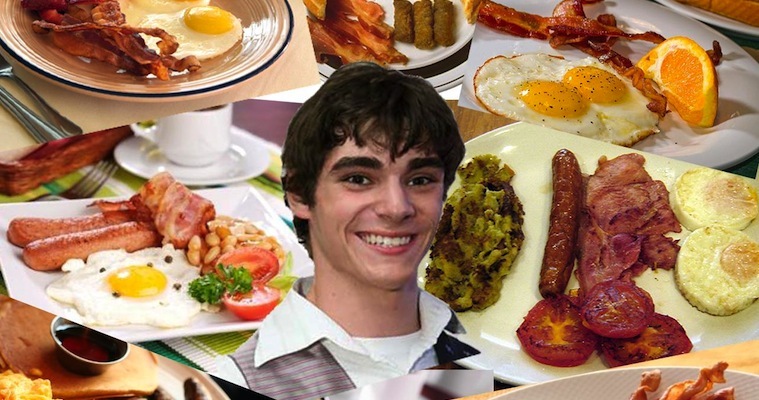 Hey, 'Breaking Bad' Fans: Give Walt Jr. A Break! In a show that's often heavy on the drama (understatement of the year), Breaking Bad fans crave, no, need the occasional break from all the talk of drug lords, Nazi assassins, and acid-disposed bodies. That's why Hank collected minerals, Saul used a Hello Kitty cell phone, and Jesse befriended "I've got the world's best Star Trek theory" Badger — to give us faithful fans a much-needed reprieve from the darkness. It's also why, it seemed, the character of Walt Jr. existed at all; between his love of breakfast, his angsty teen attitude, and his demand to be called "Flynn," scenes with Walt Jr. have become some of the primary ways for the show's viewers get some levity every Sunday night. Yet with this week's episode of Breaking Bad , the 17-year-old proved himself to be the bravest member of the White family, protecting his mother, calling the cops on his dad, and watching his baby sister get kidnapped. Making those bacon-filled gifs may be fun, but after Sunday, it seems we all owe Flynn a pretty big apology. This week's episode saw some pretty major revelations: Marie finding out that Hank was dead, Jesse discovering that Walt watched Jane die, Walt realizing what he needs to do in order to protect his family. The biggest reveal, though, was Walt Jr. finally learning the truth about his parents' secret lives. For five and a half seasons now, Flynn has been kept in the dark about Walt's true profession, and thus he has no idea about his mother's involvement, the reason behind the car wash, why his uncle was shot, and a thousand other things most of his fellow characters — as well as every viewer at home — knew long before, or at least by the beginning of this season. Yet, with the exception of baby Holly, Walt Jr. was the only character kept completely in the dark. Only told that his father had cancer and his parents had marital issues, he spent the series in naivety. Now, though, the truth is out, and Walt Jr. is forced out of his protective bubble and into the real Breaking Bad, a startling, disturbing world where his father is a murderous meth cook and his mother is a too-willing accomplice. In the span of a few hours, Walt Jr. went from teenager to adult, forced to grow up dangerously fast because of the terrible secrets his parents have finally chosen to reveal. He had hardly any time to process the information before his father began attacking his mother with a knife, and he was thrown right into the middle of a truly horrific situation. Yet instead of panicking or going into shock, Flynn literally got between his parents, protecting his mother from his knife-wielding dad. He phones the police and reports Walt as a violent abuser, staring down his father as he makes the call. His voice is shaky and scared, as anyone's would be in that situation, but he makes the call. His father's lost any sense of morality long ago and his mother's too terrified to leave, but when it comes time to prove it, Walt Jr. is incredibly brave. Just think about what he's had to go through over the course of five seasons, not even including this week's episode: His father's reoccurring cancer, his parents' separation, his family's financial struggles, his uncle's rehabilitation, and his own day-to-day life with cerebral palsy. It's an enormous amount for any teenager to handle, and it's a miracle Flynn stayed as innocently optimistic as he did for so long. Finding out that his father is evil, his mother is an accessory, his sister is missing and his uncle is dead on the very same day would seemingly put anyone over the edge — but not Walt Jr. He's shocked and upset, yes, but he's also capable of rational thinking and bravery, two things his parents' lack. In the absence of Hank and his father, Walt Jr. has transformed from naive teen to mature, heroic family protector. It may be an unwilling change, but it's one he proves he's more than able to make. And it's not like the hard stuff is over. The truth may be out, but no theory about the end of the series features Walt, Skyler, Flynn and Holly sitting down for a nice family barbecue by the pool. No matter what happens, the White family will be forever ripped apart, destroyed irreparably by Walt and Skyler's actions. So maybe it's time we stop riffing on his character and give Walt Jr. some much-needed respect. The kid deserves a break, don't you think?